Not a great week with only 66 points scored and placed 3521 overall. 7 transfer left. Last week was pretty good with 101 points over the double set of fixtures and a big rank jump into position 798. 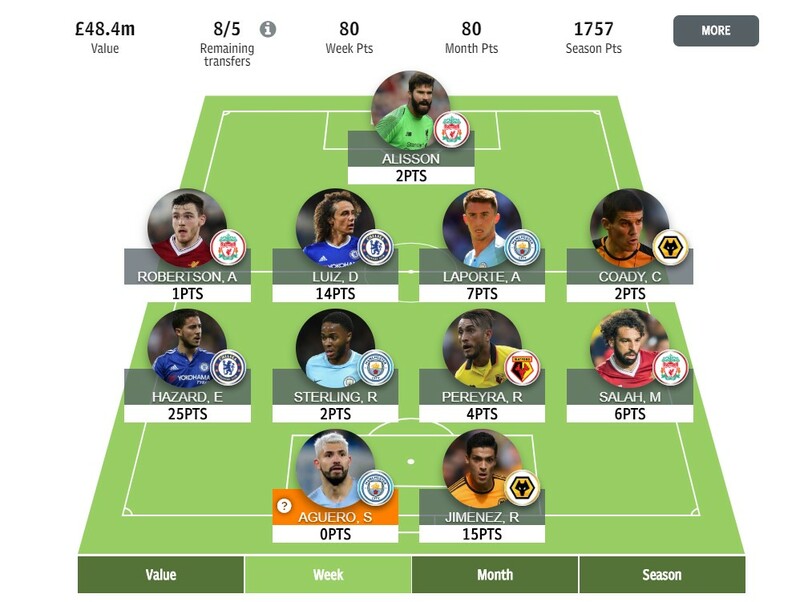 Apologies that before this I wasn’t able to update my team for a couple weeks, although not much happened then without significant transfers or rank movement. It was last week when I went more aggressive and did three moves with PVA, Pogba and Salah departing my team for KDB, King and Kane. So not great moves so far, particularly the Kane one with his injury. 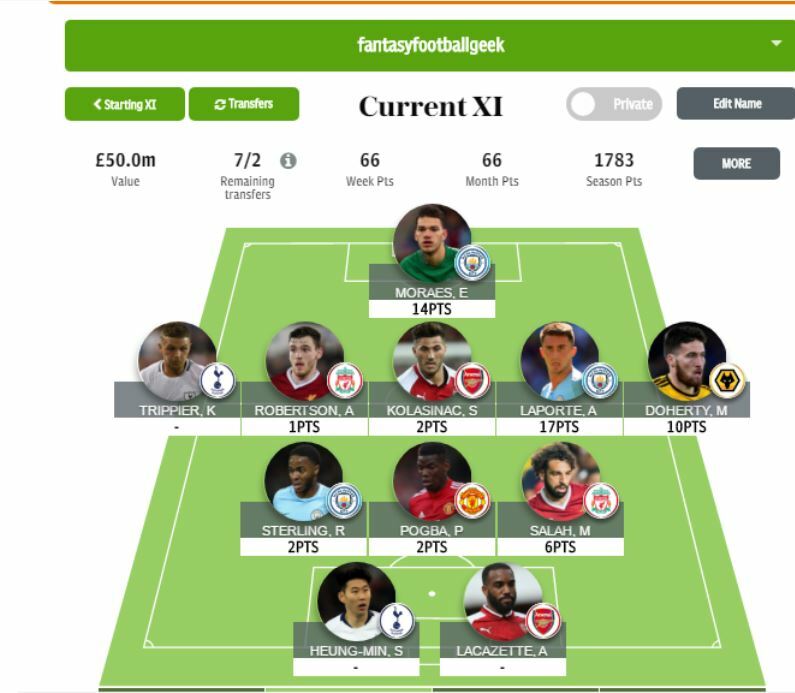 With only 4 transfers left, keeping a rank inside 1K would be a fairly successful season for this team. The players I am looking at swapping are: Kane for sure since looking dead till the end of the season. King was meant to be a 3 game punt to remove after home to Fulham next week. Madisson could also go after West Ham game next week. Hazard fixtures are mixed plus possible Europa League rotation as the rounds progress. Same thing for Kolasinac with Arsenal defence not being great. As for who to bring in, the teams with more games left are Brighton, Watford and City with 7. So a little bit of interest in Duffy and Dealofeu, but not sure if they are worth the transfer. City’s interest in Aguero and Laporte. A few teams have 6 games left: Arsenal, United, Spurs, Southampton and Wolves, among others. So Spurs are the ones that interest me the most, looking at Son or Eriksen. Might turn to Southampton if a need a cheapie. And finally there is Liverpool. So will try to play the timings in my favour to get the most extra games. For now, it will most likely be only the Kane move this week. Possibly to Duffy. Good luck this week Geekers! That has to go down as a good week. It has also left me tantalisingly close to the top 1000. Ederson did his job, netting 14 points. Doherty chipped in with 10, despite his cup exit. My newest recruit, Pereira, also got himself an assist on his first outing for me. Praise the fantasy God’s I stuck with Mr Hazard, as he collected 25 points all by himself. Good old Maddison scored another free kick, and Jimenez brought home 15 points. A solid team effort all round. My plan all season has been very fixture based, and it seems to have done alright so far. But I currently find myself at a bit of a dead end in that regard. Man City have Palace up next, but that is followed by Spurs and Man United, not to mention the second leg of their Champions League tie with Tottenham. Their fixtures do take an upwards turn on April 28th though, starting with Burnley. As this is Man City we are talking about, I can’t see myself axing any of Ederson, Aguero or Sterling. There will still be that rotation nightmare, but I’m hoping that can be slightly offset by the extra game in the cup final. Once Liverpool get the Chelsea game out the way, it looks plane sailing until the end of the season. Robertson will be staying, but the question of Salah remains. I will hold tight for now and see what happens in the Chelsea game. After Spurs take on Huddersfield, it’s Man City next, but after that it looks pretty good. This is where, like many managers, my plans have been scuppered by Kane’s ankle. I was going to bring him in for the Huddersfield game, but now I’m left considering the merits of Son. Wolves fixtures are looking pretty good right up to their final match against Liverpool. I’m not counting Arsenal as a problem. Their woeful away form has been well documented. With that in mind, Doherty and Jimenez won’t be going anywhere, and I may even consider a recall for Jota. Man United still have to play Man City and Chelsea, as well as Everton away. Their final two fixtures are interesting though, as they face Huddersfield and Cardiff. I am without United cover at present, and to be honest, I don’t feel any urge to change that. I will though be keeping an eye on things with a view to their final two matches. Leicester have Newcastle and West Ham up next before their fixtures turn. At that point, Pereira will be coming out. That could also be the point where Jota could come in for Maddison. In a bid to get the extra push in to the upper reaches of the rankings, I have come up with the following plan. I can transfer Robertson out for Duffy, bare with me. This means I would be without Liverpool defence for the Chelsea game, but, Duffy can play three times before I make the change back on the 20th, after Brighton play Wolves and before Liverpool play Cardiff. I think I will go without Son for now, possibly until after the Man City PL game. I have Alli, so will hope he can hit form against Huddersfield. There will however be the temptation to change Salah for Son. That will be a last minute decision. So, after all that rambling, I am planning on one transfer this week. Robertson and his single game, shall be making room for Duffy and his three. Is a triple clean sheet and a goal too much to ask? A par week with 80 points and a slight rank improvement. 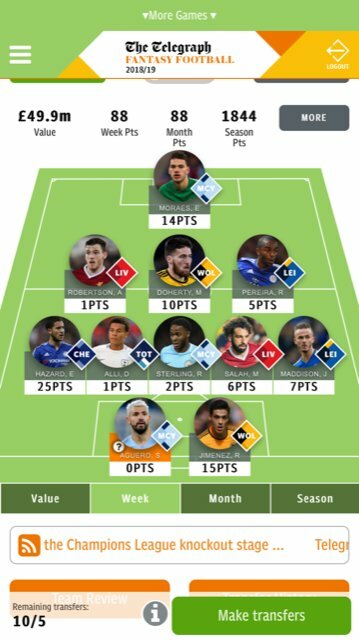 Would have been sweeter if I would have had Doherty I transferred Pogba to Laporte with a view to get In Deeney if Pereyra didn’t start (not realising the 2:05 kick off for the Everton/Arsenal game on Sun). 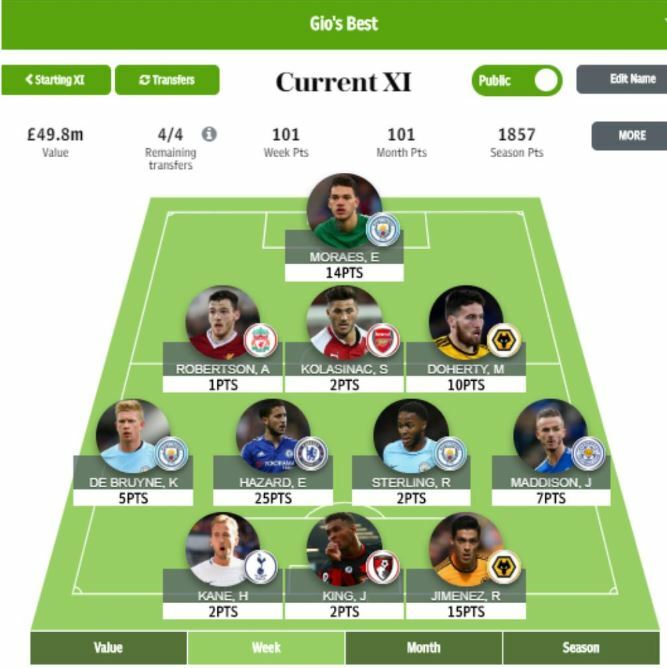 No immediate transfer plans but I’d like Deeney and De Bruyne for the double gameweeks and FA cup final so will work out the best strategy for that in terms of maximising games/points potential. That will keep me with 6 transfers in hand for late injuries, and hopefully a couple left for the final. An interesting read, thanks guys for your contributions this season. Really helped to improve my game. Hoping I can reach a top 50 finish, currently 63. Would love to be part of this article next season if possible?